I am constantly switching between brunette and blonde hair, and I do notice that when I have blonde hair, the condition of it is not so great. 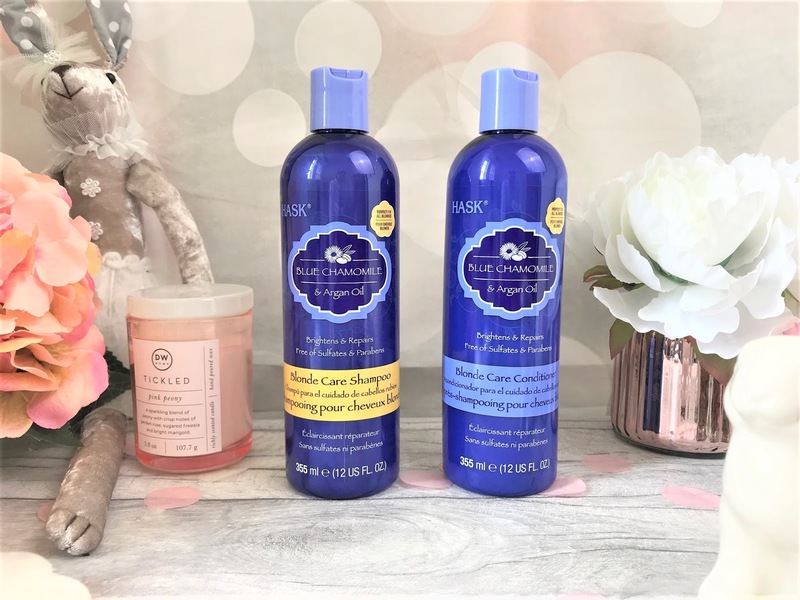 I definitely have to up my hair care game when I have highlights as the bleach tends to dry it out quite a lot, and so I was thrilled to recently receive the HASK Blue Chamomile & Argan Oil hair care products. Partly because they're blue, which is my favourite colour, and also because I find chamomile really soothing and calming. The HASK Blue Chamomile & Argan Oil Shampoo and Conditioner have been formulated to protect hydrate and tone all shades of blonde hair. Blue and purple shampoos and conditioner can help to amend any brassiness in blonde hair, and so this deep blue violet formulate helps to neutralise shades of yellow to give you a perfect blonde shade. The blue chamomile also helps to lighten and boost blonde tones and the argan oil provides shine and strength to the hair. Argan Oil has been super popular throughout the last few years, as its moisturising and strengthening properties are incredible. The scent of the shampoo and conditioner is so fresh and calming, it really is a treat to the senses when you are using it, and it also leaves a light fragrance on the hair afterwards. The Conditioner is super nourishing, and it doesn't weigh heavily on the hair, as I hate it when conditioners are too thick as I have quite fine hair and so it tends to leave a residue behind, but I definitely didn't experience that with this one. I also found that my hair became stronger where I normally get split ends and after washing and blow-drying, my hair didn't seem as frizzy. I just want to smell these all day long! The perfect Spring scent. As much as I love having a good old pampering session, some days I simply don't have the time, and so I like products that have multiple benefits and are quick and easy to use. The HASK Blue Chamomile and Argan Oil 5-in-1 Leave-in Spray is one of those wonder products. All you have to do is spritz onto wet or dry hair, and style as normal and let it work its magic. 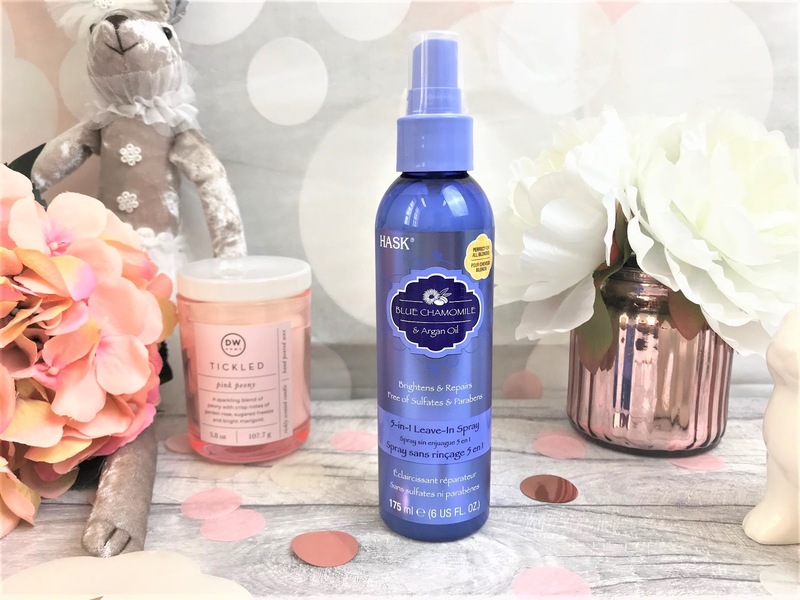 This spray moisturises and conditions the hair, provides protection against heated hair tools, controls frizz and helps to detangle, adds a stunning shine to the hair and works to prevent breakage, whilst adding moisture to the hair. Who doesn't want that?! It is super lightweight too, so of course I love that, and my hair feels so soft afterwards, I have been reaching for this so often. Ooh, and of course it has that beautiful chamomile scent to it - heavenly! 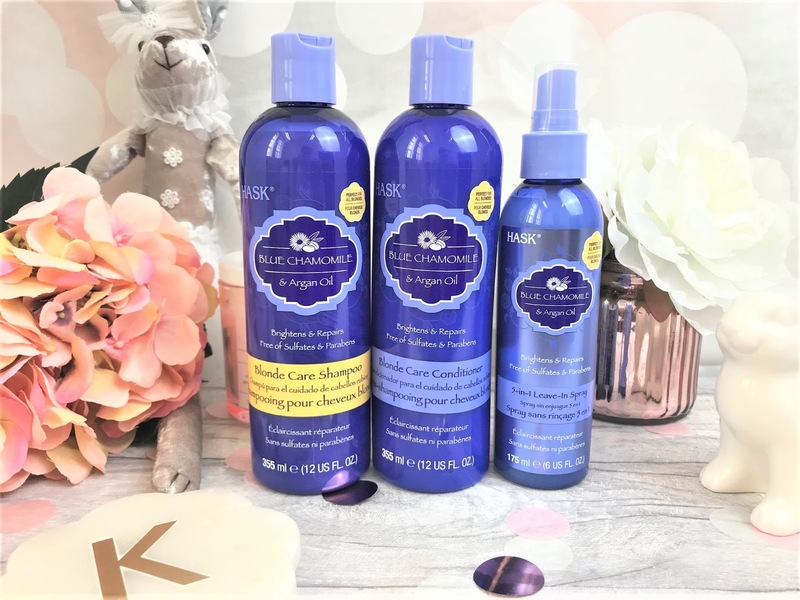 You can find the HASK Blue Chamomile & Argan Oil Hair Care range in-store and online at Superdrug here.